an exciting window into theatrical productions at the Landers Theatre. Backstage Pass Tours are open to students and curious persons of ALL ages and are available to individual ticket buyers prior to every performance of the productions below. Observe company warm-ups one hour prior to showtime and receive a guided backstage tour of the theatre, a production poster, and a photo opportunity with the cast. 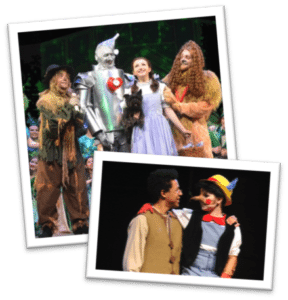 Springfield Little Theatre’s Backstage Pass Tours are now available prior to every performance! Disney’s Little Mermaid – JR. Backstage Pass Experience Tours require pre-registration at time of ticket purchase and cost $10 in addition to the price of your ticket. If you’ve already purchased your ticket, you can still add the Backstage Pass Tour by clicking here and selecting the date of your show. to arrange for a similar experience.